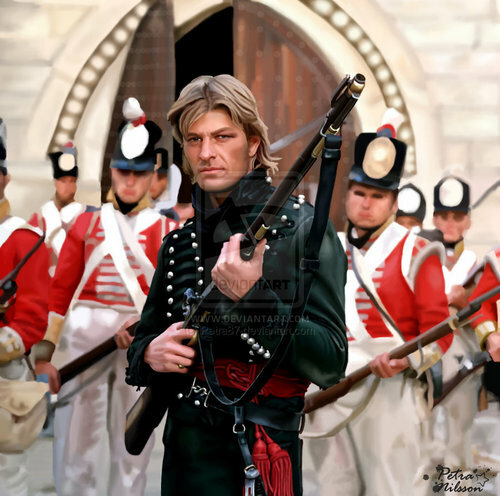 A portrait of Sean سیم, پھلی as Sharpe. . HD Wallpaper and background images in the Sean سیم, پھلی club tagged: sean bean boromir sharpe national treasure screencaps guys patriot games icons. This Sean سیم, پھلی fan art contains گرین beret, خصوصی افواج, اشرافیہ سپاہی, گرین باریٹ, سپیشل فورسز, ایلیٹ سپاہی, فوجی کپڑے, ریگامانٹلس, مکمل لباس وردی, and مکمل لباس یکساں. There might also be بندوق and تفنگ قدیم.